When we are sick, rarely any of us is excited to pay the doctor a visit. We dislike hospitals and we do tend to avoid them if we can. Similarly, pets hate going to the vets office. I mean what is there to love? You are being prickled, poked, and checked just for the sake of identifying any malfunctions in our health. This dog however absolutely loves going to the vet’s office! I seriously wish I had his enthusiasm. 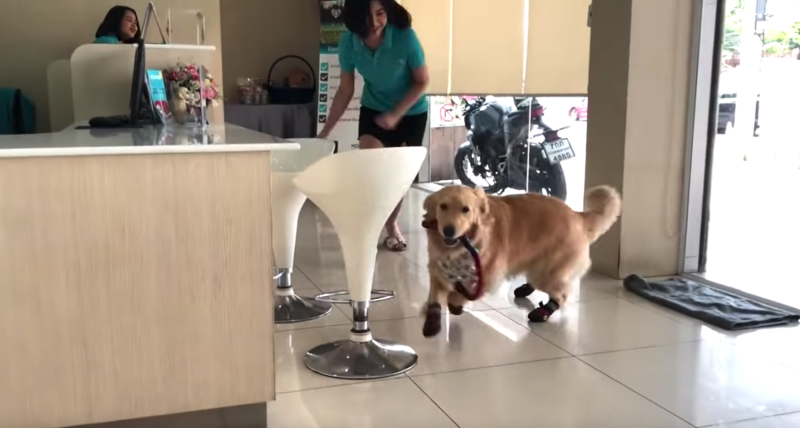 For this Golden Retriever, the office is like a playground, and you can immediately spot this by the way it enters the main door. Her leash in mouth and her enthusiasm skyrocketing, she runs inside, ready to greet everyone in the office. She runs a number of laps in the office, just like a dog would do at a park or an open space. She is genuinely happy to be here. I wish my dog (or me for that matter) were THIS happy to pay our respective doctors a visit.